I have a 1994 Audi CS Quattro which has been sitting in the garage for 10 years now. When I try to turn the key, it barely moves at all. - and now, i'm stuck!!! DO I NEED TO REPLACE THE LOCK CYLINDER/TUMBLER TO GET MY KEY TO TURN? IF NOT, WHAT ELSE CAN I DO? HOW DO I REPLACE THE TUMBLER/CYLINDER? Last edited by brokenaudi90; 10-07-2011 at 01:35 PM. HOW DO I GET IT OUT OF THERE???? So, did you actually change the ignition switch? I can't tell from your description if you did, which requires removing the steering wheel. Some ignition switches had a fault where the internal spring's attachment would break, keeping the switch in the starting position. Roughly $16 at autohausaz.com. Unless you already have the factory manual, the Chilton #70700 Passat/A4 repair manual has a useful section on the ignition switch and cylinder removal. Unless someone else understands what you mean, provide a photo to show what you are talking about. "The shaft inside the clyinder that inserts inside the electrical plug wasn't straight it was hanging down" doesn't ring a bell, so to speak. This is from Alldata, enjoy. Airbags and related equipment (e.g. steering wheel, steering column) must be disassembled, assembled and repaired only by trained Audi Service Department personnel. •Where applicable, disconnect airbag power supply connector. •Remove steering wheel and steering column switches. •Remove instrument cluster mounting screws (arrows). •Place clean, soft towel or equivalent over exposed portion of steering column. •Carefully tip back instrument cluster; be careful not to scratch face plate. •Unlock and disconnect instrument cluster harness connectors from behind. 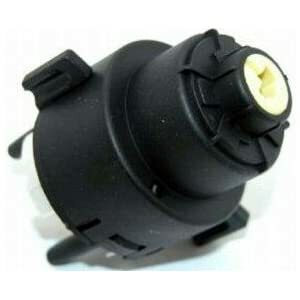 •Disconnect connector from ignition switch. •Using a small flat blade screwdriver, carefully remove protective cap for steering lock housing. Remove Torx(R) screw only when replacing the steering lock housing. For vehicles with automatic transmission, unhook additional lock on steering lock housing. •Where applicable, disconnect airbag voltage supply connector. Remove nuts (arrows) connecting steering column to steering universal joint (U-joint). •Using a screwdriver, pry up steering column approx. 15 mm (9/16 in.) and disconnect from U-joint. •Remove steering column tube retaining nuts (arrows). •Remove steering column tube bolts. •Push steering column assembly forward and down and turn until it can be removed from instrument panel. DO NOT drill into housing too deep or lock cylinder will be damaged. To make the job easier, place the steering column assembly and/or steering lock housing in a vise. •Drill one 3 mm hole approx. 1.5 mm (1/16 in.) deep in steering lock housing at location shown. •Using a punch or similar tool, press down retaining spring through hole (upper arrow), and pull lock cylinder out from housing (lower arrow). •Place lock cylinder in "ignition off" position and slide into housing in direction shown (arrows) until retaining spring locks in place. •Reinstall ignition/starter switch on lock housing if previously removed. •Install protective cap over steering lock housing. •Install steering column assembly from below into instrument panel opening. •Install steering column tube bolts and nuts, but do not tighten. •Insert ignition key into ignition lock. •Switch ignition on, so that steering column can turn freely. •Using pliers, squeeze steering column and U-joint together. •Install nuts connecting steering column to U-joint and tighten. •Align steering column tube by sliding up or down so that the steering column does not bind when turning steering wheel. •Tighten steering column tube nuts (arrows). If steering column and tube have been separated from each other, install spring first, then install lock washers on steering column. The remaining installation is the reverse order of removal.